“Don’t Judge a Book by Its Cover” is a proverb whose simple existence proves the fact that impressionable souls will do so without fail. This monthly column focuses on the film industry’s willingness to capitalize on this truth, releasing one-sheets to serve as not representations of what audiences are to expect, but as propaganda to fill seats. Oftentimes they fail miserably. 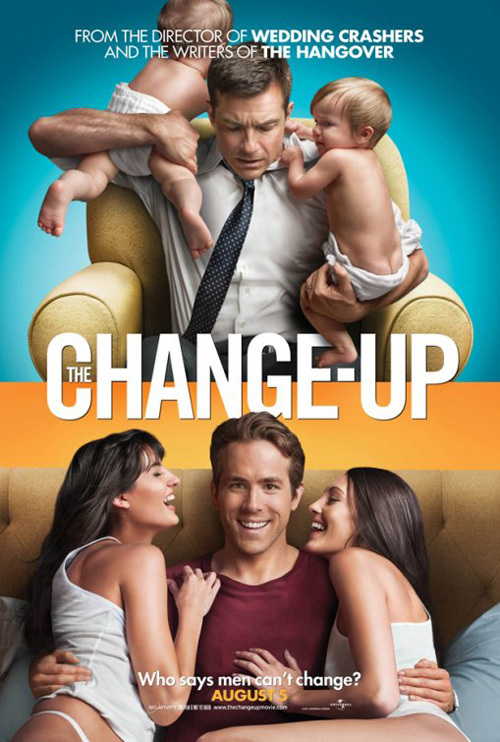 It’s sad to say, but August 2011 is a dismal month for quality poster design. I guess this shouldn’t be too big a surprise since it’s the tail end of summer and chock-full of tentpole films not needing any extra promotion. Still, though, you’d think with big budgets come creative ideas. Sometimes I wonder if studios should just open up marketing campaigns to non-professionals via contests. Cheap labor you only have to give away movie swag for? And unique, interesting art in return? Publicity firms need to start thinking outside the box. And how about Ignition Print’s advert for The Debt (opening August 31)? Helen Mirren does her best Robert Redford from Spy Game while Jessica Chastain and Sam Worthington need to double-up to do Brad Pitt justice. How much more unoriginal can you get? 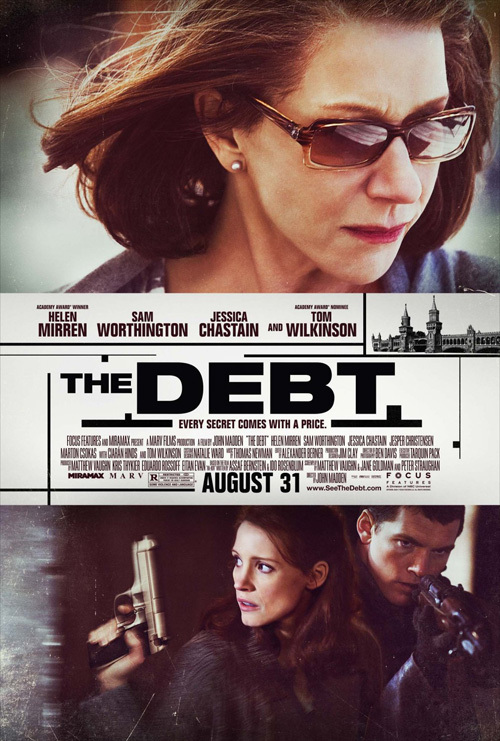 Here is an espionage thriller that actually looks pretty entertaining and smart by its trailer—two sets of good actors giving us past and present insight into what happened to them in East Berlin—given only a bland vertical triptych devoid of any intrigue whatsoever. One we’ve seen many times before. Columbiana (opening August 26) and Chasing Madoff (limited August 26) continue the trend. Both decide to give us their main subject matter—Zoe Saldana and Bernie Madoff, respectively—through Photoshop layers and filters. Without any real motion in the compositions, all we have are the textual catchphrases to give anything more than the static imagery. Ignition tried to do something in a second poster utilizing the same image of Saldana within a blood red flower, yet still fail. I’ll at least give Madoff the coincidental similarity to Robert De Niro’s lackluster What Just Happened, only because he may play the white collar criminal in a future narrative. But wait. We have worse. And yes, this block is sponsored by Adobe Photoshop. Why shouldn’t studios just slap people onto backgrounds and pretend it looks good? They need star power and the cast must all have clauses in their contracts to be on the poster … so what can they do? Jessica Alba and Joel McHale can’t do it themselves. Spy Kids: All the Time in the World in 4D (opening August 19) needs chaos and color and swooshes and hypnotizing dogs. They need to exist in one design together and on their own as well—yes, even the dog. It’s laughable how each actor is piled onto the rest, arms and legs in odd positions barely correlating with their bodies. Who knows, maybe Robert Rodriguez had his 5-year old art direct The Cimarron Group for this one. He’s such a family man. Unfortunately for Universal and Columbia, children can’t be blamed for The Change-Up (opening August 5) or 30 Minutes or Less (opening August 12). No, these are simply lazy designs recalling last month’s Friends with Benefits. First: Ryan Reynolds and Jason Bateman are slapped onto bright color fields, attached together vertically a la The Debt—the former’s coif delicately overlapping the film’s title—and Second: Pulse Advertising goes all WORKS ADV on us, mirroring their competition’s odd photo/retouched hybrids for Due Date. To take all the punch out of a film with a laugh-out-loud trailer is quite the accomplishment. Just having Aziz Ansari and Danny McBride on the poster doesn’t make it funny, (although maybe the costumes do … a smidgeon at least). And what is up with that lifeless ‘painterly’ feel? It seriously hurts my head. I can’t tell if these are real people or computerized or hand drawn. At least with Rise of the Planet of the Apes (opening August 5), we aren’t confused by realism. (How awesome is the name by the way with two ‘of thes’? They should have stuck with Caesar.) They spent the money to computer generate fully formed monkeys, so by God they’re going to sell them. The sad part is that no matter how uninspired the one-sheet, it’s still better than the previous advertisements for the original and 2001 remake of Planet of the Apes—the first too abstract to make sense and the second a wonderful example of high school level Photoshop mapping. Which brings us to August’s very own forays into remakes: Fright Night and Conan (both opening August 19). Sadly, the days of hand-painted artwork are officially dead. Renato Casaro’s gorgeous painting for the original Conan and B.D. Fox Independent’s cult classic illustration for the 1985 Fright Night are updated the only way it seems studios know how these days, with uninteresting character shots. Why compose a stunning poster to standalone when you can do one for each actor, making a series to blow-up and paste onto life-sized cardboard cubes littering multiplex lobbies? Ignition Print’s Fright Night at least attempts to mirror the mood of its predecessor, but a full bleed close-up of Colin Farrell’s mug doesn’t quite elicit the same reaction as demon clouds emanating from a quiet suburban home. But while some people may call this good, no one can look at the character series by BLT & Associates with any appeal. The poses are hilarious, the backdrops identical, and the blood splat holding the film name way too cartoony. In that regard, Ignition’s Conan is marginally better with its chaotically layered shots atop fire and brimstone. At least the expressions allude to the action-packed extravaganza we hope to experience, even if the final collected advert is a Photoshop haven for floating body collage. If only they stuck with the original teaser of Jason Momoa’s titular barbarian standing above a mountain of skulls. The aesthetic, composition, and subject matter resemble Casaro’s work from decades ago and intrigue for the movie is at its height. Don’t ask me why, but this Spanish poster from Barfutura for The Last Circus (limited August 12) works for me. Yes, it utilizes the tricks I’ve just been railing against for fifteen posters, but the aesthetic fits for a circus atmosphere. It reminds me of a better play on what Cardinal Communications USA did for The Imaginarium of Doctor Parnassus and not quite as good of an artistic flourish as that of Zachary Johnson’s illustration for The Brother’s Bloom. It feels like a dark, creepy night at the big top and I can visualize these posters on nightmarish street corners, advertising the show you just can’t resist seeing down in that back alley across town. You can, however, ask me why I enjoy the teaser sheet for Final Destination 5 (opening August 12). I love the simplicity of it, the interwoven ‘5’ and skull standing alone against blackness. Ignition has continued a successful trend with this series and it works as long as they don’t start inundating us with countless variations. Where the ‘5’ works, the next piece with steel beams protruding through the skull waters the concept down. And by the time we get to the broken bridge crumbling—two characters desperate to survive on top—I have already forgotten what I liked about the original in the first place. A couple other films fall prey to too much parity as well. 5 Days of War (limited August 19) is given a truly gorgeous foreign piece with plenty of room to breathe along with some real depth thanks to the red plus designs adding perspective. The film’s America firm should have ported the design over, it’s a soft, minimal work starkly contrasting its eventual domestic brother full of fiery explosions, boxed faces, and horribly retouched actors. Rupert Friend’s face looks awful, its smooth texture and painted bruises straight out of a bad video game cut scene. As for the long-awaited release of Don’t Be Afraid of the Dark (opening August 26)—its January 2011 release date printed not even the original opening date—I don’t know how the studio could have walked away from the stunning line drawing Ignition put together over a year ago. To replace such a provocative image with a film still, changing the angular, foreboding clawed shadows with their real-life, almost comical counterparts, is an error in judgment. I’m all for showing actual footage, but sometimes the tease is the way to go. Even the bad months have a handful of winning designs, though, and this subpar 30-days are no different. My favorites aren’t necessarily flashy or fresh, but they are captivating in their orchestration. Ignition’s (wow, they’re a popular firm) one-sheet for The Help (opening August 10) is an unlikely winner. It is simple and to the point, much like it’s plot, but beneath the static imagery and large title font—a pleasant mix of serif and sans—is a well thought out composition. Contrasting the full-color people with the orange-tinted background allows them to pop without looking like cut and paste. They exist within a heightened state of observation, our main focal point out from the abyss of type. I like this one a lot. Next comes a poster that literally snuck up on me. Unknowing until just before publishing this piece that Bellflower (limited August 5) was releasing before the summer closed, I hadn’t even considered looking at what Mojo did. I have to assume they are the firm behind both entries posted, but even if they just did the version with its romantic embrace juxtaposed against a towering inferno of flames, I’d still be applauding them. It is the newest design, however, that astonishes in its minimalism, soft, pastel-like overexposed sky, and gorgeous use of a slab serif font. I know nothing about this film yet I am absolutely entranced and completely sold on buying a ticket today—even though I loathe cars. Brighton Rock (limited August 26) follows, getting an edge this month simply because I recently finished up the unjustly canceled “Human Target”, the watercolor feel of this poster unable to remove itself from comparison with that television show’s opening credits. It’s steely look into the determined face of Sam Riley combines with the fog-like treatment of the imagery to hide a mystery at its center. The white space is gorgeous, the birds flying at his head a well-placed flourish, and the dripping absorption of a painted landscape a perfect entry point into the dusk sky and trench coat wearing weather pulsating and pulling you in. But the champion of the month is, without a doubt, One Day (opening August 19). Designed by Mojo, the simplicity of its blue-tinged image is without compare. A second entry was crafted, splitting the photo of Anne Hathaway and Jim Sturgess into a grid of Polaroid pictures, and works in its own way, but not as well as its fearless counterpart. Mid-kiss and exuding all sorts of romantic sensuality, you know what the film is about and feel safe in its independent flavor, hoping for something beyond the clichés of its genre. The simple font doesn’t need drop shadows or lined borders; it’s readable despite fluctuating contrast with what’s beneath. No matter how often I looked at the collection of posters culled together this month, One Day simply caught my eye each and every time.